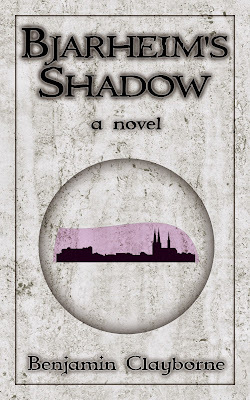 So, life intervened, but I'm back now, and plan to finish Bjarheim's Shadow over the next few weeks. Odds are against maintaining the one-a-week schedule from before, but then when have I ever been told the odds? “I am Aiar,” the fae said, as if his name should be enough for anyone. Erik could feel his father’s chest move as he drew in a great breath. “Master Halgrin never said you were a nitwit!” his Da shouted. “Excuse me?” Djalgand said, all traces of humor vanishing. All the yelling was making Erik anxious. And the wind had begun to kick up, chilling Erik through his furs. He wished Aiar or Ollemar would weave some magic to warm them all. Erik wanted to do it himself, but didn’t trust his abilities, especially not with that blasted ironspeaker’s ward surrounding him. No one wanted to risk his wrath again, so the whole group followed in silence as Djalgand Skaldi tromped through the ice and snow. Erik noticed that his compulsion to run into the golden ward had nearly vanished, now that they were inside it. He was sore from being held up by ropes for hours, but he didn’t want to complain now that their goal was in sight. Djalgand glanced back every so often. He seemed to be muttering something to himself, almost like soft humming. Erik tried not to meet his eyes, but it was difficult to look away. Djalgand radiated power. They followed him for several minutes, through thickets of stone pillars and spiky black outcroppings. Those grew denser and denser until at last they came to what looked like an impenetrable wall of black rock. Erik was reminded of the Vângr’s tightly packed wall of trees. Instead of going through a tunnel under the wall, however, Djalgand stopped and began to sing. It was just as Erik remembered from all those times he’d sat outside an ironspeaker’s forge, ear pressed to the wall, listening to the haunting melodies. Only now there was nothing between him and the singer, and Djalgand’s voice filled the air around him, coming from everywhere and nowhere at once. For a few moments nothing happened, and then a jagged line of golden light appeared in the rock face, stretching from down on the ground to higher than Aiar’s head. The line began to thicken, and there was a colossal grinding noise as the two halves of the rock wall swung aside. In moments they’d left a gap, wide enough for two men abreast. Djalgand led the way inside. Within the rock was a hewn chamber, circular and twenty paces across, domed at the top. Six golden lamps burned around the perimeter. Their light did not flicker the way a candle’s would, but rather stayed perfectly even. There was a bed, a table, two chairs, and several large chests stacked around the edge. Erik was released from his bindings, and spent a while massaging the feeling back into his legs. He glanced at the black stone walls again, and marvelled at how easily Djalgand had split them open—with nothing more than singing, no less! “How does that work?” he asked the ironspeaker. “I liked her pitch better,” Djalgand said dryly, jerking a thumb at Kari. “You didn’t answer him,” she said. Djalgand settled down a bit and said no more for a while. He put on a fire in a round pit at one edge of the room, and hung a kettle on a hook over it. The fire was nearly smokeless; what few fumes it did emit roiled up through a fist-sized hole in the ceiling. Erik thought he saw glimmers of gold light among the flames, and even amidst the smoke, but it was hard to tell. Djalgand met Erik’s eyes. For the first time, the old bearded ironspeaker didn’t glare, or scoff, or laugh bitterly. “You’ll die trying,” he said. “No I won’t,” Erik said reflexively. He took a breath. “I learned to use the methar in a couple of days, and I could draw power from the Seed of the Brandrinn in the same time. I’ll bet you anything I can learn ironspeaking just as quick.” He stared defiantly, but anxiety made his innards quiver. Erik looked around. It had been only a day, and already he was starting to be able to see the shimmering golden strings of light that Djalgand spoke of. They were everywhere, it seemed, ebbing and flowing like currents in a river. Sometimes they seemed to cluster together, like a flock of starlings in flight, spinning and curving about. And so it was. When Erik woke up the second day, before he even sang a note, he could see skeins of golden light swirling in the air above him. He realized that they were pulsing in time with Djalgand Skaldi’s voice. The web was far more complex than anything he’d ever seen, even beyond the green-and-violet tapestries that had been woven by Aiar and Ollemar back in the forest. Djalgand was holding a long piece of iron, easily twice Erik’s height and as thick around as his wrist. As Erik watched, the golden strings spun tight around the top of the iron, and when they dispersed, Erik saw that the tip had been bent into a point. Djalgand lowered the iron and inspected his work closely. A few more swarms of strings fluttered in and scraped against the spike as Djalgand continued singing, minutely adjusting its shape. Soon the point of the iron pole gleamed perfectly smooth. Djalgand nodded. His earlier reluctance to teach had all but vanished. He was a patient and calm teacher, completely unlike Aiar and Ollemar. The fae and the Brandrinn, in fact, both kept quiet and watched whenever Djalgand was instructing Erik. Erik wondered if the two felt ashamed over how they’d acted before. Ollemar might. Aiar… probably not. Finnar and Kari spent most of their time sitting and watching as well, but with less interest. Kari, for one, got up and paced around every so often. She eventually asked Djalgand if he’d open the cave walls again so that she and Finnar could go out hunting. “You might find some hares or snow voles, but it won’t be much,” the ironspeaker warned them. Kari persisted, and eventually Djalgand sang the walls open for them. They returned that evening with two small hares they’d caught. Better than nothing, Erik supposed. “I made a deal long ago with some traders from the south. They deliver me goods every couple of months, and I give them ironwork. I meet them at a cabin a day southeast of here, so they’ve no idea I live in the Styggen. I doubt they think anyone’s mad enough to try.” He grinned. Erik was starting to like Djalgand. He hoped the old ironspeaker would join them when they went south to fight the Shadow. And when is that supposed to happen? Erik thought. There were no threats here, no Remy following them, no refugee Bjarheimers to watch over. And yet each night Erik dreamt of Bjarheim, its streets running thick with black ooze, its towers and spires crumbling to ash, the skeletons of his friends and neighbors rotting in the streets… He didn’t know if it was really that bad, but until he could actually go there, his imagination would keep filling in the gaps. After five days, Aiar began to grow restless. “How long will it be?” he asked curtly. “Time we do not have,” Ollemar grumbled. In five days, Erik didn’t feel like he’d learned much. He could see the golden strings pretty much all the time, if he chose to. Ignoring them was easy, but as soon as he sang just a few notes of the Song of Seeing, his vision was nearly clouded with bundles of golden strings flitting to and fro. “I can bend metal a little,” he said. He picked up a little square of iron that Djalgand had given him to practice on. Erik began to sing, very softly, waiting until he saw the strings respond to his voice. In a few moments they did, swirling slowly around him, waiting for further command. He’d learned only a few small tricks so far. If he concentrated fiercely, he could slowly bore a hole into the iron. He demonstrated, and then passed the iron fragment around to Finnar and the others. “Ironsong doesn’t affect our magic,” Aiar said dismissively. “Something simple,” Aiar said. “Perhaps a shield, as we did in the forest.” He reached into the air before him and started tracing lines of violet light, lines that Erik knew only he and Aiar could see. 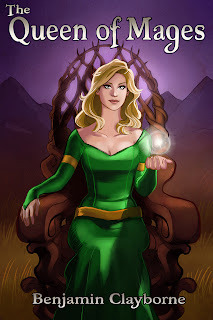 Ollemar followed suit, and wove his green Brandrinn magic into the gaps of Aiar’s web. Erik stared at the little threads, wondering how they’d fit into this tapestry of light. And then it hit him. He sang a series of high notes, one of the few tricks he’d learned: a melody that would tighten the strings into coils. One by one, individual threads of golden light bent and slid across the surface of the shield. Erik focused on one of them, watching it, waiting for it to be in exactly the right place. And then he sang the final note. The golden thread wrapped around two adjacent lines of light—one violet, one green—and pulled fast, immobilizing them.